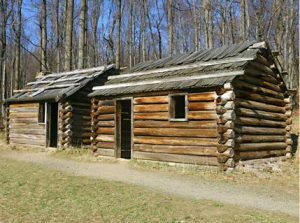 For example, most people may not know that there was a winter encampment in 1779–80, three miles from Morristown, New Jersey, which proved even more disastrous than the famous winter at Valley Forge the year before. This winter of 1779–80 was one of the most severe winters in New Jersey history, and a shortage of clothing and provisions caused great hardship to the men making camp that winter. Dr. James Thacher, a Continental Army surgeon from Massachusetts, kept a detailed diary and described the winter conditions near Morristown, during which time some soldiers deserted, others pillaged nearby civilian farms, and continental currency waned in value. “Having removed the snow [Dr. Thacher wrote on 9 December 1779], we wrapped ourselves in greatcoats, spread our blankets on the ground, and lay down by the side of each other, five or six together, with large fires at our feet, leaving orders with the waiters [watchmen] to keep it well supplied with fuel during the night. We could procure neither shelter nor forage for our horses, and the poor animals were tied to trees in the woods for twenty-four hours without food, except the bark which they peeled from the trees. Lieutenant W. and myself rode to Morristown, where we dined, and fed our starving horses at a tavern. 1 January 1780: “[A] new year commences, but brings no relief to the sufferings and privations of our army. Our canvas covering affords but a miserable security from storms of rain and snow, and a great scarcity of provisions still prevails, and its effects are felt even at headquarters. The remarkable detail provided by Dr. Thacher in his diary shows us not only the hardships endured over the winter of 1779–80, but also the steadfast firmness that the soldiers who were at this camp at Jockey Hollow displayed during their encampment. For anyone interested in reading these first-hand accounts of men and women in New Jersey during this time period, this historical text compilation is highly recommended. Larry R. Gerlach, ed., New Jersey in the American Revolution, 1763–1783, A Documentary History (Trenton, N.J.: New Jersey Historical Commission, 1975), xiii. Gerlach, New Jersey in the American Revolution, 1763–1783, 346. I highly recommend a visit to the historical park shown in the photograph. One can see and enter the cabins and the nearby home of the family. One can read the excellent interpretive material available at the park to learn about the experience of the soldiers and the family. There is also a pleasant hike. Thanks, Andrew, for this interesting article and introduction to the book edited by Gerlach. I agree with Janet. I live two towns away from Morristown, and thank you for letting others know that the Winter Encampments here were worse than Valley Forge. There is an excellent short movie at the Visitor Center that tells more. I enjoyed this article very much. I grew up in that area and visited Jockey Hollow often through the years. Our Girl Scout troop also “camped there”. I could ride my horse from my home, across fields and one road to the encampment at Jockey Hollow and the Tempe Wick house in order to enjoy its fields and reconstructed areas. The area surrounding Jockey Hollow National Park is a beautiful Pre-Revolutionary part of Morris County, New Jersey. Not many people know about the dreadful winters the Revolutionary soldiers had to endure while they were encamped here. Living in the area we grew up knowing the history and the stories. People would even find deceased soldiers while digging in their yards. They were not burial sites but more likely men who had succumbed to the awful weather while either walking home or deserting because the winter situation was so desperate. Thank you for this article.